The February 7, 2018 issue of JBJS contains another in a series of “What’s Important” personal essays from orthopaedic clinicians. This “What’s Important” article comes from Dr. Bassel Diebo. At a time when the suffering in Syria seems unremitting, Dr. Diebo tells of starting his surgery residency in a besieged Damascus hospital at the start of the Syrian uprising in March 2011. He came to America at the end of 2012; worked hard at NYU Hospital for Joint Diseases, the Hospital for Special Surgery, and SUNY Downstate Medical Center; passed the USMLE exams; and landed an orthopaedic residency almost 6 years to the day after the Syrian uprising began. If you would like JBJS to consider your “What’s Important” story for publication, please submit a manuscript via Editorial Manager. When asked to select an article type, please choose Orthopaedic Forum and include “What’s Important:” at the beginning of the title. Because they are personal in nature, “What’s Important” submissions will not be subject to the usual stringent JBJS peer-review process. Instead, they will be reviewed by the Editor-in-Chief, who will correspond with the author if revisions are necessary and make the final decision regarding acceptance. Sometimes, being too flexible is not a good thing. In the February 21, 2018 edition of The Journal of Bone & Joint Surgery, Kim et al. show that patients with generalized joint laxity—those who can hyperextend their knees and elbows beyond 10°, for example—tend to have poorer knee-stability and functional outcomes after anterior cruciate ligament (ACL) reconstruction than those who have normal joint flexibility. The authors studied 8-year outcomes among 163 patients who underwent a unilateral ACL reconstruction. In all cases, the same surgeon performed the same procedure (bone-patellar tendon-bone autograft), and all patients went through the same rehab program. In terms of graft-rupture rates and contralateral ACL rupture rates over the study period, the authors found no statistically significant differences between the 122 patients without laxity and the 41 patients who were determined preoperatively to have generalized joint laxity. However, at the 8-year follow-up, the patients with laxity had less knee stability (as measured with Lachman and pivot-shift tests and an arthrometer) and worse knee function (as measured with the Lysholm and IKDC scales) than patients without laxity. Click here for a two-minute video summary of this study. Atukorala I, Makovey J, Lawler L, Messier SP, Bennell K, Hunter DJ. Is there a dose-response relationship between weight loss and symptom improvement in persons with knee osteoarthritis? Arthritis Care Res (Hoboken). 2016 Aug;68 (8):1106-14. Thorlund JB, Englund M, Christensen R, Nissen N, Pihl K, Jørgensen U, Schjerning J, Lohmander LS. Patient reported outcomes in patients undergoing arthroscopic partial meniscectomy for traumatic or degenerative meniscal tears: comparative prospective cohort study. BMJ. 2017 Feb 2;356:j356. Hamilton TW, Athanassoglou V, Mellon S, Strickland LH, Trivella M, Murray D, Pandit HG. Liposomal bupivacaine infiltration at the surgical site for the management of postoperative pain. Cochrane Database Syst Rev. 2017 Feb 1;2:CD011419. Jawhar A, Hermanns S, Ponelies N, Obertacke U, Roehl H. Tourniquet-induced ischaemia during total knee arthroplasty results in higher proteolytic activities within vastus medialis cells: a randomized clinical trial. Knee Surg Sports Traumatol Arthrosc. 2016 Oct;24(10):3313-21. Epub 2015 Nov 14. Cafri G, Paxton EW, Chen Y, Cheetham CT, Gould MK, Sluggett J, Bini SA, Khatod M. Comparative effectiveness and safety of drug prophylaxis for prevention of venous thromboembolism after total knee arthroplasty. J Arthroplasty. 2017 Nov;32(11):3524-28.e1. Epub 2017 May 31. Thus, the 24 issues we turn out in 2018 will constitute our 100th volume. To help celebrate this milestone, throughout the year we will be spotlighting 100 of the most influential JBJS articles on OrthoBuzz, making the original content openly accessible for a limited time. This 14-page, amply illustrated article was the oldest paper selected by Kavanagh et al. in their 2013 JBJS bibliometric analysis of the 100 classic papers of pediatric orthopaedics. Blount and Clarke proved definitively that long-bone growth could be arrested by appropriately timed epiphyseal stapling and that growth would resume after staple removal. Their work spared many children with linear or angular leg deformities—often a result of polio—from the risk of more invasive operative methods. Fast forwarding 60 years from the Blount and Clarke study, we arrive at this epidemiological analysis of >51,000 revision hip replacements. The findings from this 2009 Level II prognostic study provided information that has guided THA research, implant design, and clinical decision-making throughout the past decade. OrthoBuzz occasionally receives posts from guest bloggers. This guest post comes from Matthew R. Schmitz, MD, a member of the JBJS Social Media Advisory Board. The American Academy of Pediatrics (AAP) Section on Orthopaedics and the Pediatric Orthopaedic Society of North America (POSNA) recently issued a list of tests and treatments that physicians and patients should avoid. The list appears on the Choosing Wisely® website, an initiative of the American Board of Internal Medicine (ABIM) Foundation. The list highlights 5 commonly encountered pediatric orthopaedic scenarios/conditions that often consume excessive time and resources with little or no clinical value in return. The Evidence Based Committee and Advocacy Committee of POSNA developed the peer-reviewed list and vetted it through both the POSNA Board of Directors and the AAP Executive Committee. Screening ultrasound for developmental hip dysplasia is not needed if the newborn has no risk factors and has a clinically stable hip exam. The substantial rate of false positives with screening ultrasounds likely causes many children to undergo unnecessary treatment. Simple in-toeing does not require a radiographic workup or brace or surgical treatment in children younger than 8 years old. Unless there is severe tripping, falling, or marked asymmetry, a watchful waiting approach is best for this condition, which typically resolves with growth. Custom orthotics or shoe inserts are not needed for children with asymptomatic or minimally symptomatic flat feet. If the flatfoot is minimally symptomatic and flexible (arch reconstitutes when the child stands on his/her toes), it can be managed with observation or over-the-counter orthotics. Advanced imaging such as MRI or CT should not be ordered for most musculoskeletal conditions in children until all appropriate clinical, laboratory, and plain film examinations have been done. Most pediatric conditions can be accurately diagnosed with a good history, physical exam, plain radiographs, and occasional labs. Use advanced imaging only if a specific question arises from the preceding workup. CT scans expose patients to high levels of radiation and should be used judiciously. If MRI is deemed necessary, it is best to have the consulting orthopaedist order the MRI with specific protocols and sequences. Buckle fractures do not need follow-up radiographs if pain and tenderness have resolved after immobilization. These common pediatric injuries are inherently stable. Both POSNA and the AAP should be commended on their evidenced-based and common-sense approach for tackling these common pediatric orthopaedic conditions. Matthew R. Schmitz, MD is vice chair of the Department of Orthopaedics and chief of Pediatric Orthopaedics and Adolescent Sports Medicine at San Antonio Military Medical Center in Ft. Sam Houston, Texas. 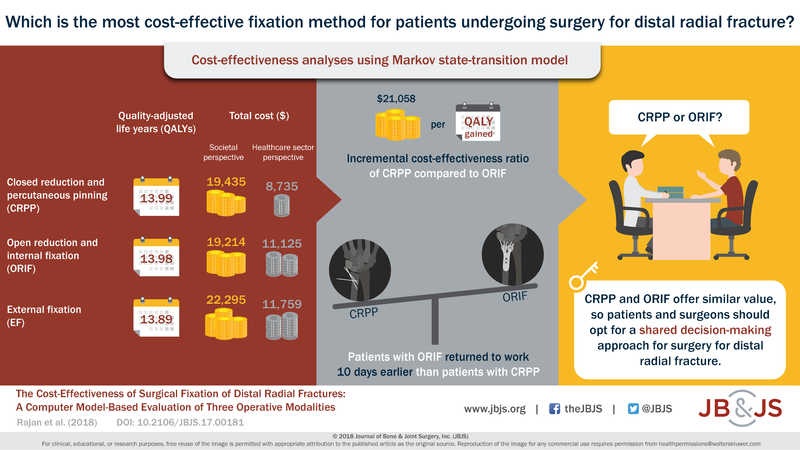 The bundled-payment model has found some early success within the field of orthopaedic surgery, most notably in joint replacement (see related OrthoBuzz post), However, more robust risk-adjustment methods are needed, especially in terms of patient factors. That is the message delivered by Cairns et al. in their retrospective analysis of Medicare data from 2008 to 2012 published in the February 21, 2018 edition of JBJS. The authors make a compelling case for improved risk stratification of hip- and femur-fracture patients to ensure that all patient populations have and retain access to appropriate care. The authors analyzed reimbursements for the surgical hospitalization and 90 days of post-discharge care among nearly 28,000 patients who met inclusion criteria for the Surgical Hip and Femur Fracture Treatment (SHFFT) model proposed by the Centers for Medicare and Medicaid Services (CMS). Their findings highlighted various inconsistencies that could have unintended consequences if not accounted for in the bundled-payment model. For example, reimbursements were $1000 to $2000 lower for patients in their 80s, who tend to have more comorbidities that require more care, than for younger patients. CMS proposed using Diagnosis Related Groups (DRGs) and geographic location to adjust for risk in its SHFFT bundled-payment model, but Cairns et al. identify several other factors (such as patient age and gender, ASA and Charlson Comorbidity Index scores, and procedure type) that could provide a more realistic stratification of risk. The article clearly articulates how risk adjustments that don’t include more specific patient factors could lead to a multitude of unintended consequences for patients, providers, and the entire healthcare system. These findings could remain relevant now that CMS has announced an “advanced” voluntary bundled-payment model after the Trump administration cancelled SHFFT in late 2017. Whatever bundled-payment model takes hold, the totality of the orthopaedic literature strongly suggests that the best outcomes are derived from making specific treatment plans for each patient based on the individual characteristics of his or her case. It seems reasonable that the best bundled-payment plans would do the same. The association between spinal cord compression and functional deficits following cervical spine trauma has been well studied using both CT and MRI. However, until now, there was little data evaluating whether that same association is true for thoracic spine injuries. In the February 21, 2018 edition of The Journal, Skeers et al. identified the same correlations between canal compromise, cord compression, and functional outcome in the T1 to L1 region. Using retrospective data, the authors showed that the severity of neurologic deficits was associated with the amount of maximal cord compression, as measured with advanced imaging. More specifically, their univariate analysis showed that cord compression >40% was associated with a tenfold greater likelihood of complete spinal cord injury compared to cord compression <40%. This study also found that MRI measures osseous canal compromise more accurately than CT, probably because it more clearly visualizes soft tissue changes related to the posterior longitudinal ligament, ligamentum flavum, and facet capsule. A major issue with this study (and with almost all studies that evaluate spine trauma) is that these advanced imaging techniques are temporally static; even when they’re obtained relatively soon after injury, they cannot capture the position of vertebral body fragments and posterior structure deformities that existed upon impact. This shortcoming is probably more relevant for younger patients, who are more likely to experience higher-velocity trauma. The population in the Skeers et al. study is skewed a bit toward older patients (mean age 34.8) with relatively severe spinal injuries (mean TLICS of 7.8 and mean cord compression of 40%). These factors may highlight the roles that lower bone density and decreased soft tissue elasticity play in the setting of high-energy spine trauma. Although the data reflect some variability, this study should help spine surgeons counsel patients and their families following these tragic injuries. The more severe the initial cord compression in the thoracic spine, the more likely there is to be severe neurologic injury without improvement. This evaluation of the arthroscopic tension-band suture technique demonstrated that arthroscopic repair of an isolated supraspinatus detachment delivers good to excellent functional and tendon-healing results—and that the absence of tendon healing does not necessarily compromise pain relief and patient satisfaction. Berndt and Harty’s elegant clinical and anatomic study included a four-stage radiological classification scheme for traumatic talar lesions that still provides a valid foundation for decision-making with regard to operative or nonoperative treatment.